Christmas Eve has always been the highlight of our family’s Christmas season. My parents made this day a very special occasion growing up. 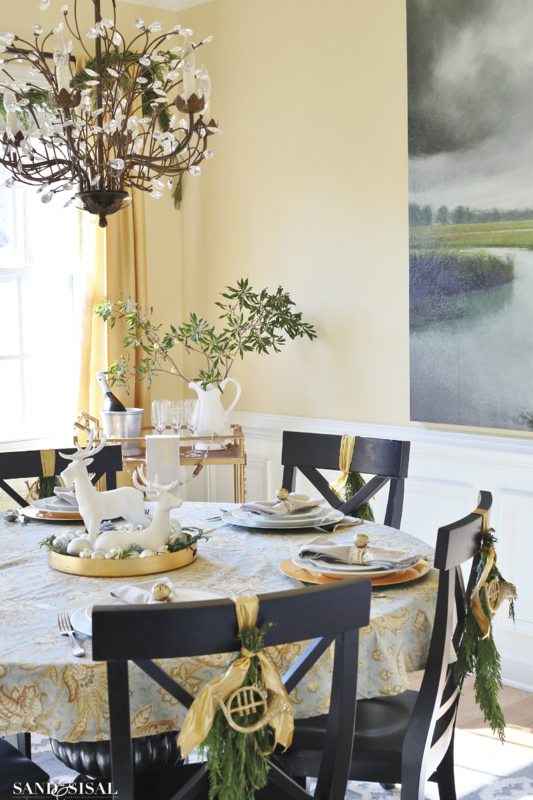 We dressed up in our holiday best, drank hot wassail, nibbled on hors’ doeuvres then sat down for an elegant meal in a beautifully decorated dining room. Mom would bring out the Christmas china and crystal. Afterwards we sang carols, read from scripture and performed our own little Christmas pagent for family and friends. It was quite the celebration! I want to continue the traditions with my own family. You are invited to come and take a little Christmas Dining Room Tour in silver and gold and see how we will be celebrating Christ’s birth! Let the trumpets sound… a child is born! 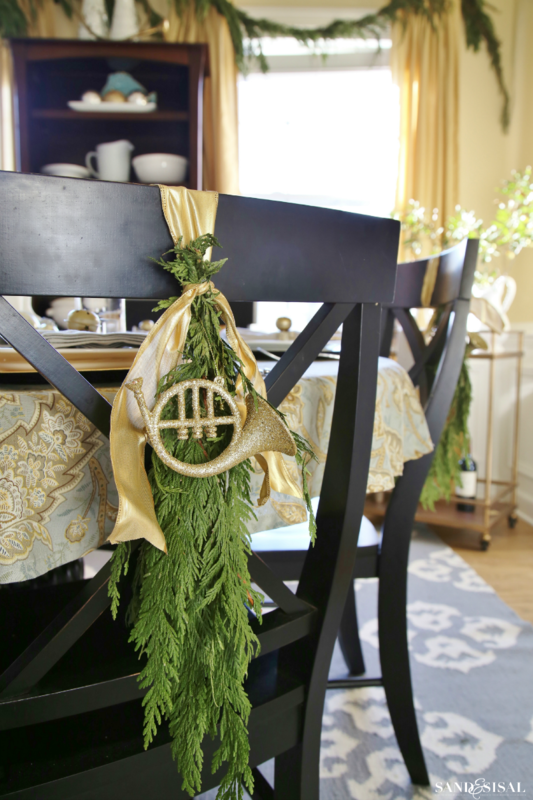 The chair backs are dressed up with simple chair swags. These are so crazy easy to make and last for a few weeks! Mom always brought out her Christmas best china. Shhhh… I tell anyone, but I don’t even own china! 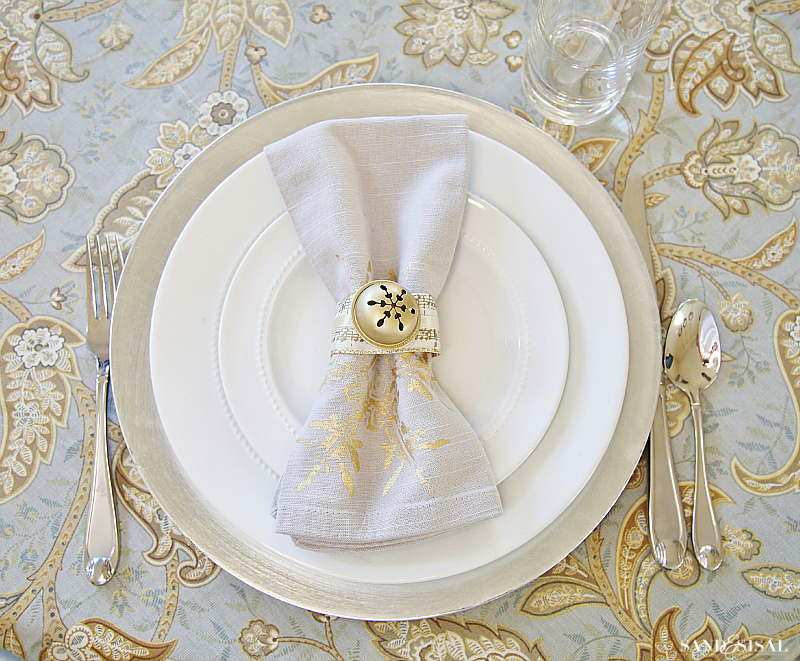 This place setting is my everyday dishes from Target layered on inexpensive silver and gold chargers. 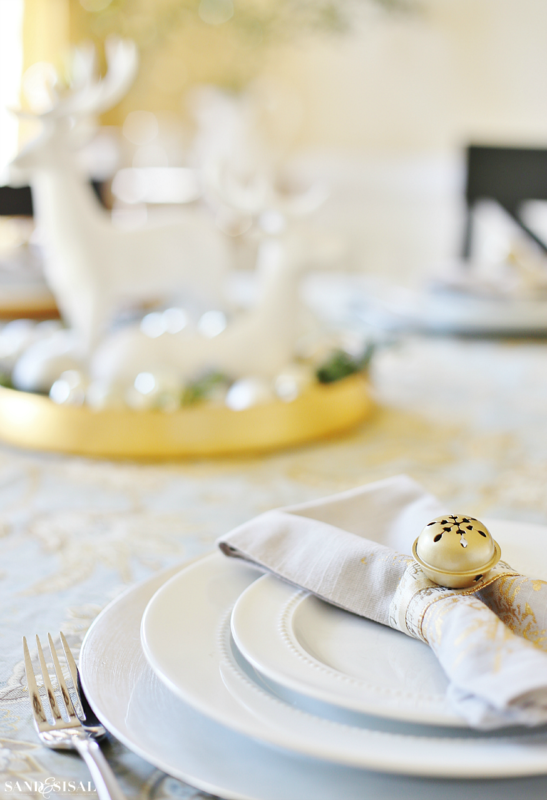 Gray cloth napkins with gold snowflakes are tucked into DIY Jingle Bell Napkin Rings. I love creating centerpieces. This one took less than 5 minutes! 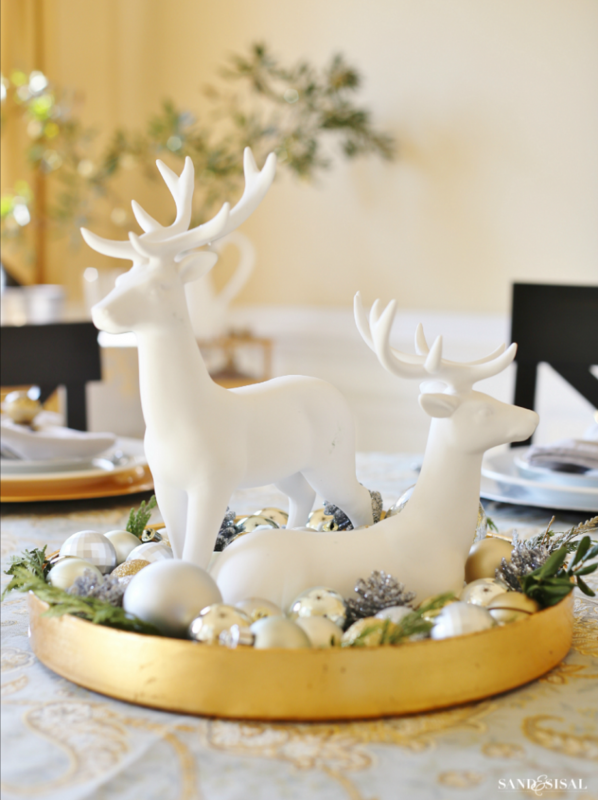 Grab a tray, layer some fresh greenery from the yard on it, place two reindeer statues, and surround with dollar store ornaments an pinecones in silver and gold. 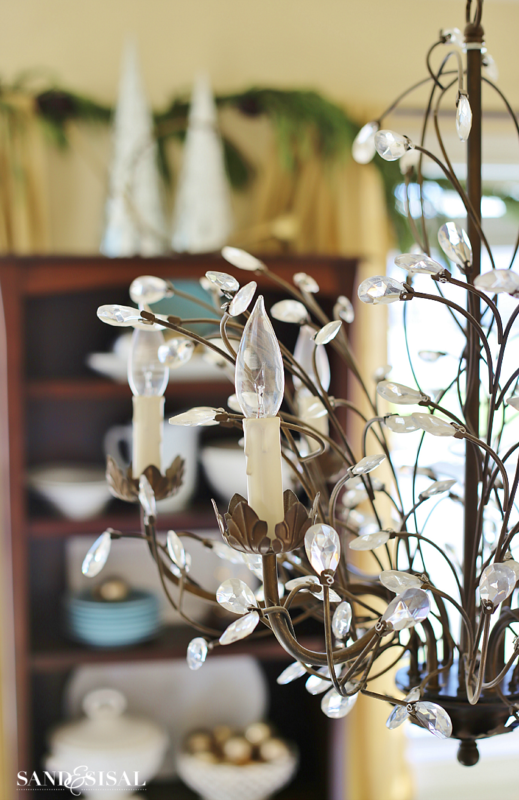 Centerpiece Tip: Make sure your centerpiece is not too tall. You should be able to easily see the person across the table from you. 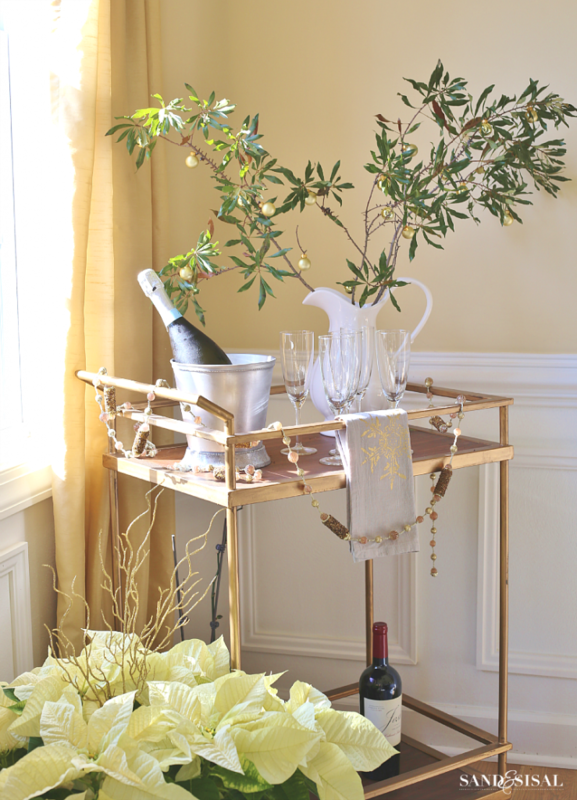 A Christmas champagne bar cart is ready for toasting! 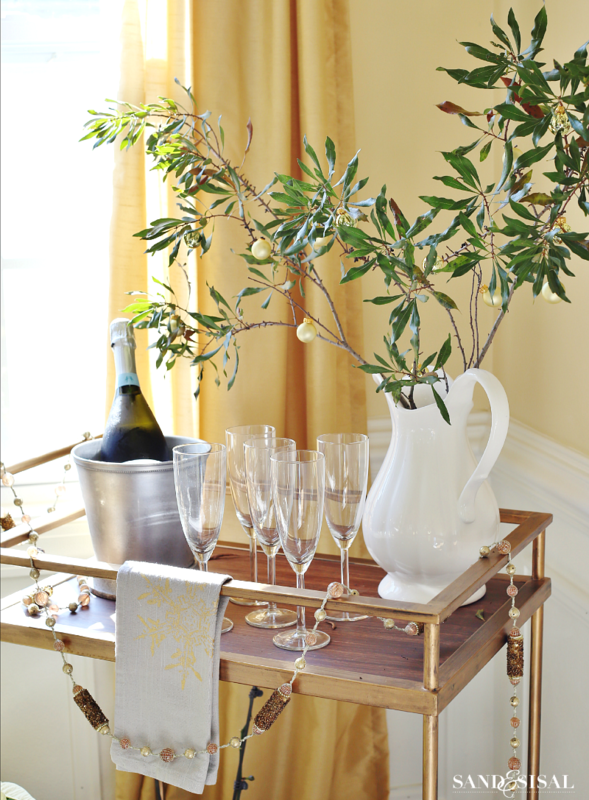 Fresh clippings from the back yard are placed in a large vase with water and adorned with a sprinkle of tiny glass ornaments. Simply lovely! I draped the windows with red cedar garland. You can usually find it affordably at Home Depot. I used the cedar for the chair swags too. 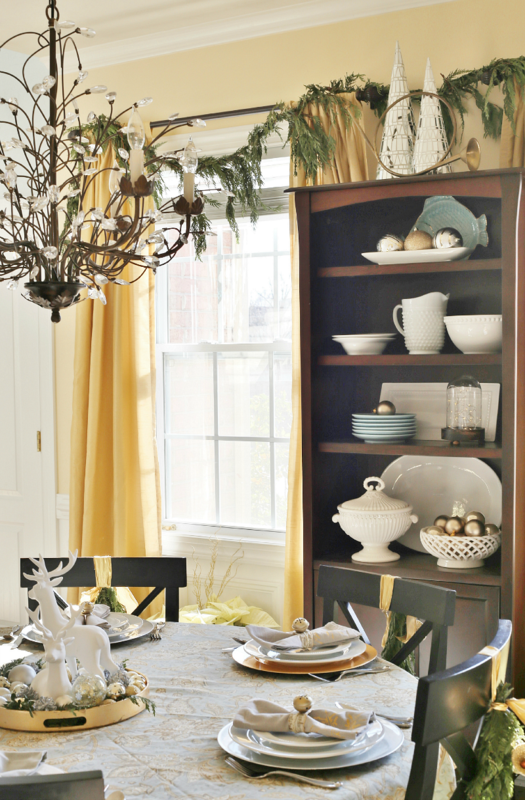 The thrift store brass horn repeats the trumpets and music motif from chair swags and jingle bell napkin rins. 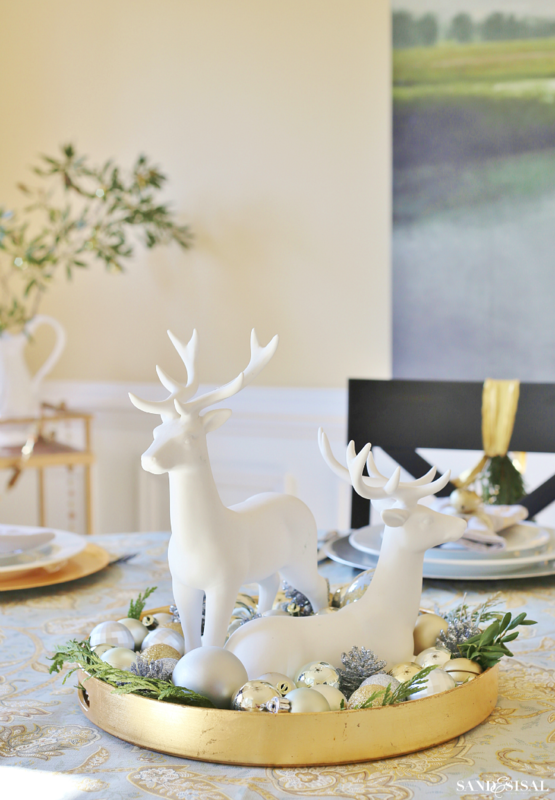 I hope you enjoyed our Christmas Dining Room Tour in silver and gold. Let the Christmas celebrations begin! You dining room is gorgeous! 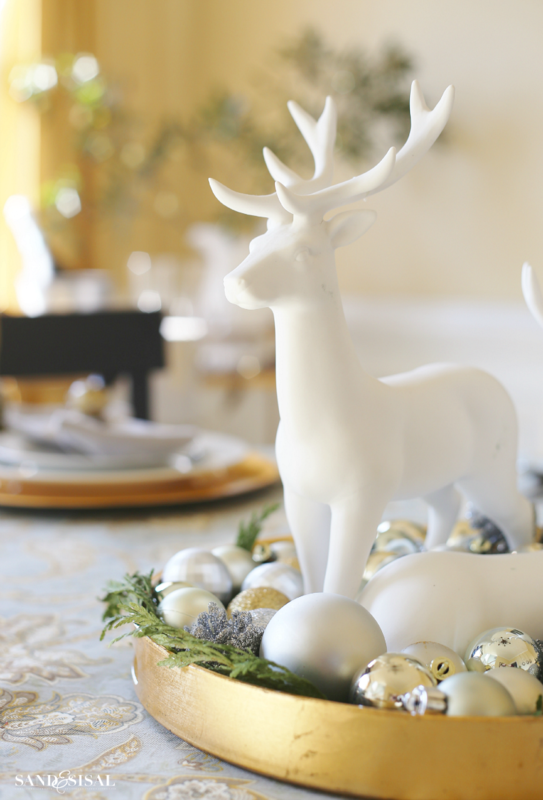 I love the sparkle of the silver and gold and all your festive touches. Also, seeing your bar car makes me want to put one on my Christmas list! Such a great piece to decorate! 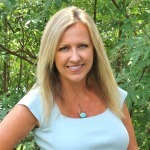 Your dining room is simply gorgeous, Kim! 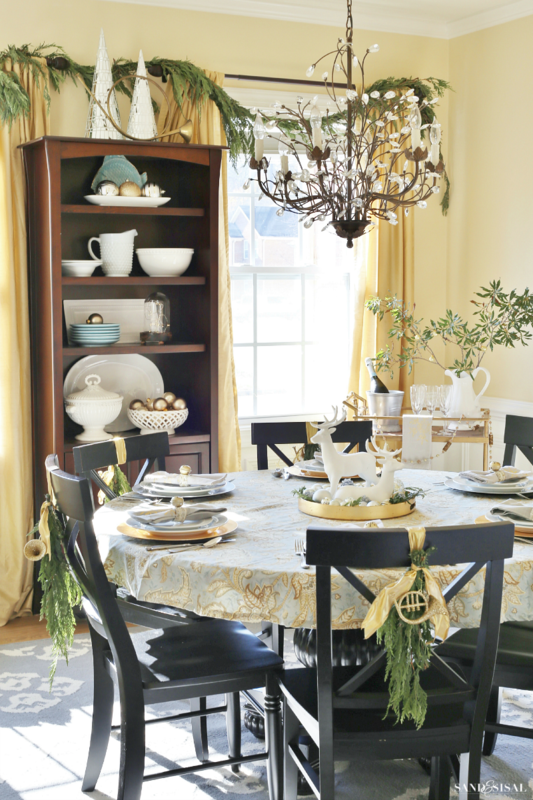 I love the silver and gold theme, the centerpiece and those cute little swags on the chairs, pretty! What a lovely table you’ve created. I am especially taken with the tablecloth you’ve used. Was it the inspiration for your color scheme? Do you mind sharing where it came from? Thank you & Merry Christmas!